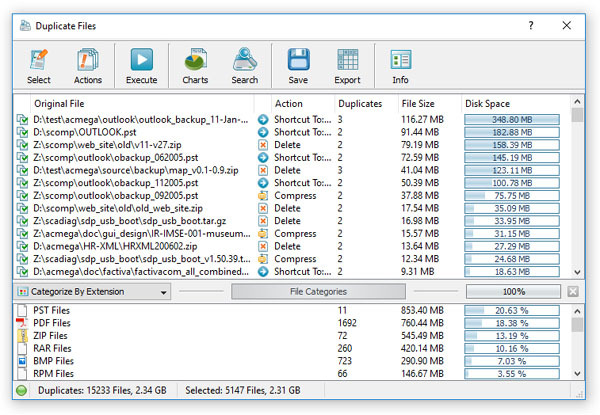 DupScout Server is a server-based duplicate files search and removal solution, which runs in the background as a service and allows one to perform duplicate files search operations, review detected duplicate files, save various types of reports, remove duplicate files or schedule fully-automatic, periodic duplicate files search and removal operations. DupScout Server may be controlled using a full-scale client GUI application and the DupScout command line utility locally or via the network. 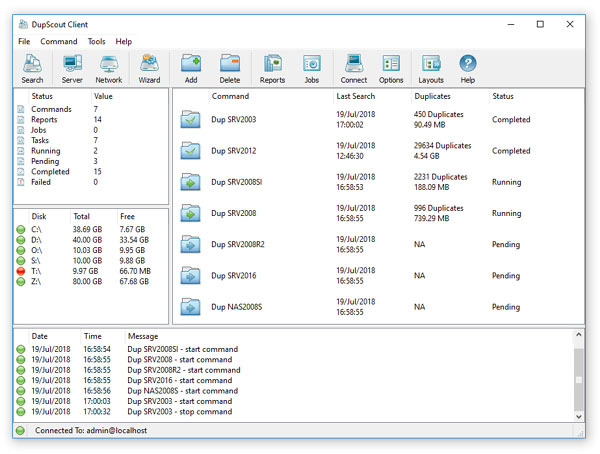 DupScout Server allows one to configure an unlimited number of duplicate files search operations, with each one capable of detecting duplicate files in one or more disks, directories, network shares or NAS storage devices. The user is provided with the ability to review detected duplicate files, generate HTML, PDF, text, CSV, XML reports or export reports from multiple servers to a centralized SQL database and perform advanced history trend analysis. DupScout Server provides a large number of duplicate files removal options including the ability to replace duplicates with shortcuts or hard links, move duplicates to another directory, compress and move duplicates or delete all duplicate files. In addition, users are provided with the ability to schedule conditional duplicate files removal operations capable of removing duplicate files fully automatically according to user-specified rules and policies.